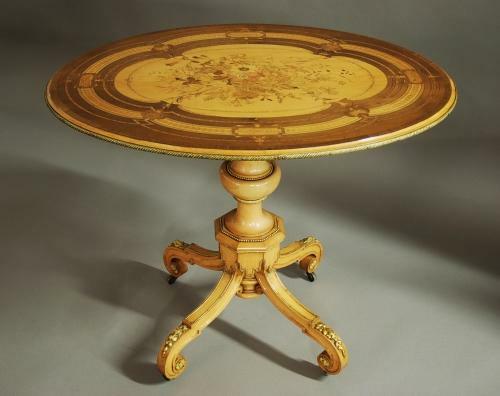 The elliptical shaped top consists of a finely executed marquetry flower and foliage design of superb quality surrounded by various borders and inlays of exotic woods including Kingwood banding, rosewood banding, cross grain banding and stringing, scallop shell inlays with an ormolu moulding to the edge. The turned column, which is also embellished with ormolu mounts, leads down to four scrolling legs with floral ormolu mounts and paterae terminating on castors. Jackson & Graham were a furniture company established in 1836 by Thomas Jackson & Peter Graham in Oxford Street, London. They created high quality furniture producing pieces with fine marquetry work using rare woods and good quality mounts. Many pieces were exhibited in the International exhibitions of the time and their clients included Queen Victoria and Napoloeon III. In 1885 the company was taken over by Collinson & Lock. This centre table is in very good original condition and can go straight into a home or collection.